With a 3-D model of IWC's WildWay behind them, INHF's Land Stewardship Director Erin Van Waus (left) and IWC's Executive Director Marlene Ehresman form two pillars of protection bridged by the Deed of Conservation Easement. Hoorah for permanently protecting WildWay's conservation values! With many hours of hard work by our volunteer labor force, and donations for materials from our wonderful supporters, the first building on our IWC campus becomes a reality. 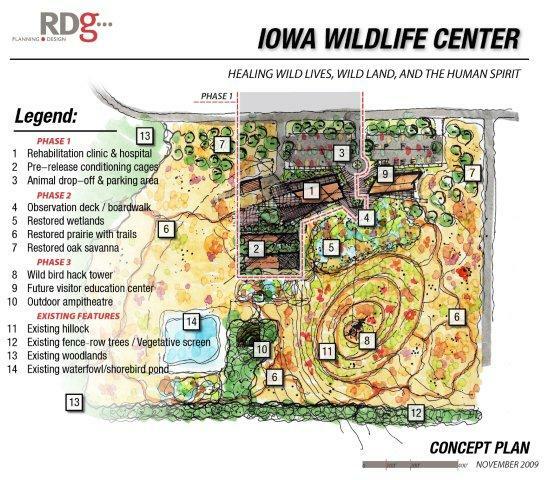 RDG Planning and Design of Des Moines worked with Iowa Wildlife Center's co-founders and others for a year and have come up with a wonderful concept for the site that reflects their understanding of the land we call WildWay as well as the needs of the staff and wild patients. Do you see the little building next to "Building 1", the wildlife rehabilitation clinic and hospital? Because of an opportunity that we didn't want to pass up, we decided to construct this future maintenance and storage shed first and use it for multiple purposes, including for public education and skills training. We suspect it will house a wildling or two during these early years, as well. In the fall of 2010, we began raising funds to begin construction and successfully raised enough money to match a $25,000 challenge grant by May 1, 2011. With this money in hand, the IWC board of directors gave the go-ahead to begin construction in spring of 2011. Be assured that before we move from any concept to our reality, the Iowa Wildlife Center Board of Directors, Steering Committee and Executive Director will be balancing sustainable design, ecological impact and the needs of patients, staff and volunteers with fiscal responsibility.